Wabash and DePauw got Bell Week off to a spirited and competitive start Wednesday with the annual dual meet between the two schools. Despite being outscored 32-0 in diving, the Little Giants stayed even with DePauw heading into the final two events before losing 153-141. Even with that edge, Wabash battled from the outset of the meet. DePauw opened with 13 points on the opening relay, offset by the second-place finish by the Wabash 200 medley team of Eric Vaughn, Evan Rhinesmith, Adam Current, and Robert Fozkos. The quartet touched in 1:38.71. The Little Giants bounced back by finishing 2-3-4 in the next two races. Chad Woods was second in the 1000 free with a time of 10:22.65. Elijah Sanders finished third (10:27.59) with Brian Graham taking fourth (10:33.84). Craig Vetor scored second-place points in the 200 free by finishing in 1:45.96. Logan Falley was third at 1:48.11, while Jordon Blackwell grabbing fourth place (1:48.29). 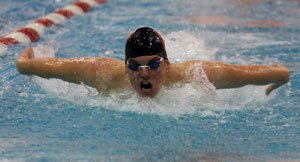 Vaughan and Nick Rockefeller helped Wabash make up more ground in by sweeping the top-two spots in the 100 backstroke. Vaughan won the race with a time of 54.47. Rockefeller was right behind, finishing in 56.12. The Little Giants’ biggest finish came in the next two events. The Little Giants swept the top-three spots in the 200 butterfly. David Birrer won the event (2:00.70). Falley and Current helped Wabash outscore the Tigers 16-3 in the event by securing second and third place, respectively. Falley finished in 2:05.31, while Current touched in 2:06.58. Wabash made it back-to-back 1-2-3 finishes with the results of the 50 free. Fozkso won with a time of 22.00, just ahead of Blackwell (22.09) and Blaine Cooper-Surma (22.41). Blackwell, Vetor, and Cooper-Surma kept the Little Giants close again with their finishes in the 100 free. Blackwell was second (48.21), while Vetor took third (48.70). Cooper-Surma followed in fourth (49.37). Vaughn added another victory, this time in 200 backstroke (1:59.84). Rockefeller took third place this time, touching in 2:04.81. Rhinesmith followed with a win in the 200 breaststroke (2:16.27). Wabash clung to a slight lead after the 500 free and 100 butterfly. Falley was second in the 500 with a time of 4:59.19, and Woods took third with a time of 5:00.35. Current, Fozkos, and Birrer snared second, third, and fourth in the 100 fly. Current finished in 54.12, Fozkos in 55.02, and Birrer in 55.03. The Tigers regained the lead after earning all the points in three-meter diving. Wabash’s only chance was to battle back in the final two events of the evening. Vaughn got the Little Giants off to a good start by winning the 200-yard individual medley with a time of 2:01.10. Sanders helped offset some of DePauw’s points in the race with a fourth-place finish (2:05.83). The Tigers took control, however with a win in 400 free relay. The Wabash team of Blackwell, Cooper-Surma, Kermin, and Vetor (3:12.98) finished less than a second behind the DePauw squad’s time of 3:12.01. Wabash returns to action next weekend with its final home meet of the season. The Little Giants will serve as hosts for the Patrick Woehnker Invitational set for November 21 and 22. Photo - (top right) David Birrer on his way to victory in the 200 butterfly.